At first I was just curious after seeing 1 episode of EXTREME COUPONING.. a guy got $1,000 worth of stuff and paid like $35 Granted- he bought what- 12 cases or Raisin Bran (also donated most of it to his church's FOOD BANK. ) SO I thought WHY NOT?? I'll try it- can't hurt to learn how to save my family's money right?!! I got FREE MILK and saved over $57! OK- OK- I KNOW - LONG TIME NO POST RIGHT? even if only hitting the WALL OF YELLOW at HEB- I AM STILL SAVING! what I have done for the trip- so let me see if I can explain. before they expired and I HATE to let them expire! I had a few things I NEEDED today and a few things I got just to STOCK UP. getting $10 in Extra care bucks back which I used in the next transaction. getting $6 back - which I used in the last transaction. fem products- razors etc and snack stuff. goldfish and wheat thins etc. 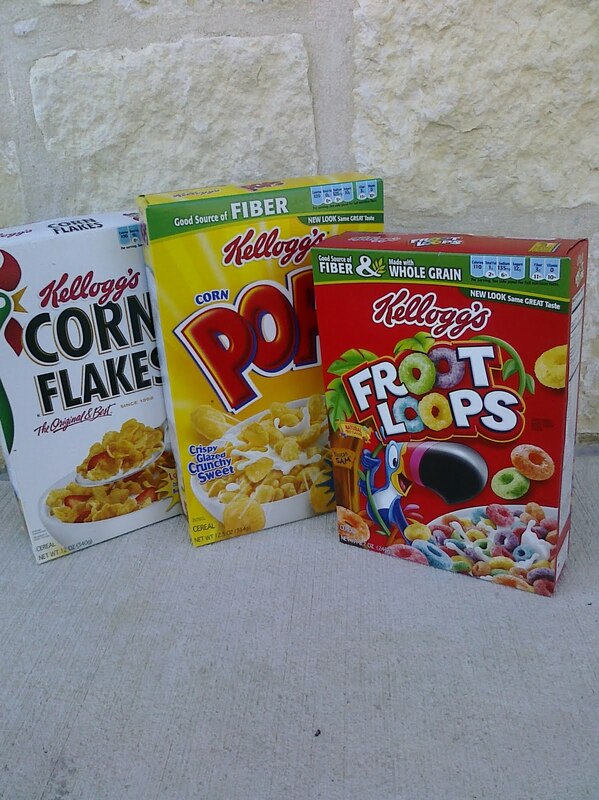 not buy large packages of say cereal - cookies and ranch flavored crackers etc. and are easier to repackage and stretch out over a week's time. I don't feel bad about spending a little of my own. IT COULD HAVE BEEN EVEN BETTER! that was a free deal at CVS this week. like the mascara and nail polish and lip gloss etc. On to Walgreens - I like to combine the trip since it is right across the street! 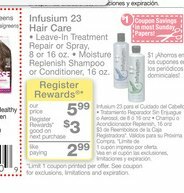 infusium shampoo got you $3 back in register rewards. 2 milk gallons which they had on sale for $3.19. she told me a man bought nearly $100 worth of items last week for about $3. are doing by saving $ and don't stare at you like you are stealing something. by using sale items- coupons and their FREE MONEY! ALL on brands I like and use! Saved $38 at Target! Plus $10 in gas from CVS! OK - I did actually buy a few salad dressings this time (6) - however I did not "clear the shelves" so to speak- there were plenty left for everyone else. I liked this deal cause I could get different flavors of dressing. I got ranch - cucumber ranch- italian lite and spicy italian ( good as marinade) and a raspberry vinagrette and a thousand island. I paid .69¢ a bottle (for 6) by stacking a manufacturer coupon on top of the target deal. Kraft 16 oz dressing was $ 1.69. So I used 2 different coupons on each set of bottles. 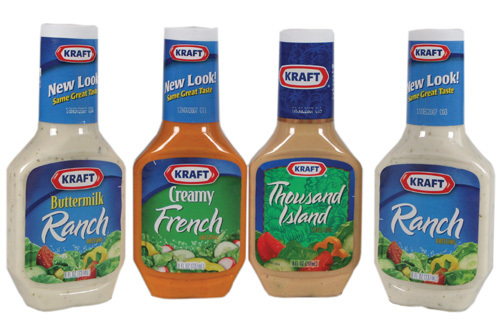 1/2 Kraft dressing, 14 oz. +, RP 5/15 (RED PLUM newspaper insert dated 5/15) I had 3 papers- so I cut 3 coupons. Yippee- I will not need dressing again for 3-4 months - well until they expire anyway. 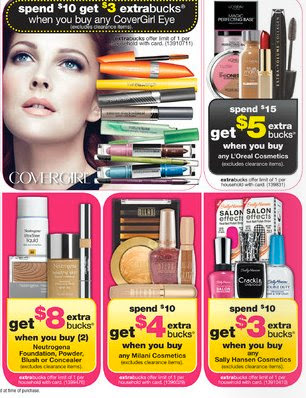 I have a hard time sometimes remembering to shop my normal "list" since I am so determined to find my coupon steals! HARD to focus on both - this print list helps me to make sure I remember all of my items! ON to CVS- I paired up a few items in their "buy $30 - get $10 in gas" section with coupons I had on hand- to get $5.00 off of my $30 spent.. and I got $10 back- so all in all it was like I spent $15 and got $30 worth. Always scan your card before you shop- I got another health and beauty $5 off coupon and that changed the way I shopped for that trip. I was a bit disappointed that there were not any coupons in this week's paper- perhaps due to Memorial Day holiday weekend. MAYBE double the coupons in next week's paper. 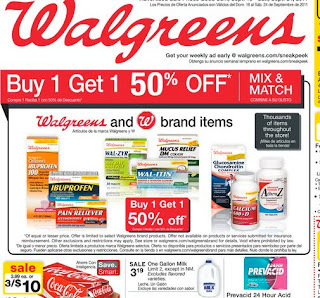 I am really enjoying the concept of letting CVS buy my next papers- so I get more coupons for free. but I feel it is WORTH IT! The trick is not to look at the inserts and start cutting. i was using the coupons i found BEFORE they went on sale or i could stack with a target coupon etc. I did save .55c or so- but if I waited I could have saved 2-3xs that amount. So now I wait. I print online ones but only if I know WE WILL use those coupons. Like yogurts and snack bars and cereal etc. Check out the blogs on the top right side and follow them to get your advance notice of Sunday's coupons! I got paid to buy toothpaste! Ok- so I am finally getting the handle on the stacking and the specials. BONUS- I used my "free money" ECBs from CVS to buy another paper today. Since I don't have a subscription... I used their money to get more coupons to save more $$. Kinda creepy- a never ending savings circle. I might make a habit of that on SUNDAYs when I shop. OK- so I finally got PAID to buy something. and I actually got paid $2 to buy them! They would not have handed me the two bucks in cash- but I can spend ECBs the next time I shop! a deal and my deodorant was like $1 each.. I spent gas and time to drive over there..
but far enough to make me pause anyway. Oh yeah- I got .25¢ credit too for using my "green" shopping bag. Over $300 worth in coupons in this week's paper! 4¢ BODY WASH!! Saved $26 at TARGET! I was super proud of my deals today. I snagged a Nivea body wash for less than a nickel! making my body wash just .04¢! WOO HOO! 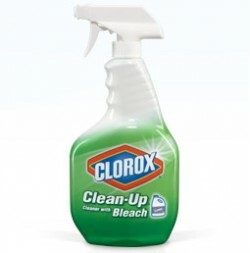 I also snagged a 2 bottles of clorox clean up for about $1 each from WALGREENS! Probably my biggest savings today was on 3 packages of diapers- TARGET ha a buy 3 get $5 gift card PROMO- so I did- then I applied a $3 coupon to 1 pkg- and 2 other $2 off to the others- making my total savings $12 on just the diapers!! I was able to finally use a $5 off pedigree dog food coupon- HEB doesn't carry the LOW FAT kind my dog needs- and the coupon expired in 4 days! Making my bag cost only $8! I used several coupons at TARGET today- but I was especially tickled by my .25¢ each box of nature valley granola bars- also combining a target coupon with a manufacturers coupon - I GOT 2 boxes! I still have yet to be able to USE my PUREX softener coupons- every time I go.. they are totally OUT- NEW PRODUCT! 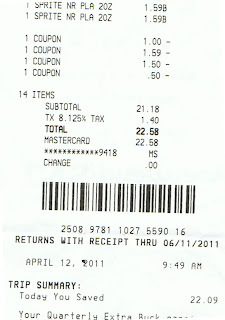 I saved $26 in coupons at Target this trip- spending just $36... that is a pretty great savings! SO NEXT WEEK MAYBE I CAN HAVE AN EVEN BIGGER SAVINGS!! Also at CVS on SATURDAY night I was able to snag free deodorant for Brett! ( I know I know I am sooo boring Shopping on a SAT night!? RIGHT???) BTW- if you are unsure call your local CVS to see when the Sunday's paper circular goes into effect- Stone Oak is 9pm- and Bulverde Road is MIDNIGHT Sat evening- can you guess where I was headed at 9pm on Saturday? STONE OAK! I will tell you most of the crowd was "last minute" BEER shoppers- they don't have much patience for a lady with 10 coupons in her hand!? :-) Normally I would go at 5:30 am - when I first wake up- but it was after all EASTER SUNDAY! OK- I ventured out into the "UNKNOWN LAND OF WAGS" - er- Walgreens. I am also learning all of the "terms" the coupon queens use. ONE store for awhile till I got my bearings. I chose CVS. Walgreens has a similar "bucks" back program- but you do not have to sign up for anything... it is simply automatic when you buy special "deals" in store. 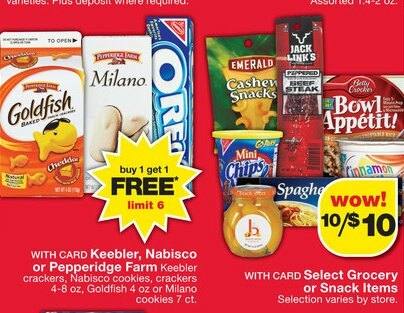 They also have a booklet of coupons up front with a month worth of savings that you must pick up and hold on to. There was a coupon in the circular from the paper- but she just scanned it off of her "copy" she held on to near her register. Walgreens had a BUY 1 GET 2 deal on rolls of scotch tape ($1.99) - not a bad deal in itself. However- my advisors to the right over there sent out an update and I found that there was also a SCOTCH manufacturer coupon that could be added to that as well- so VIOLA! 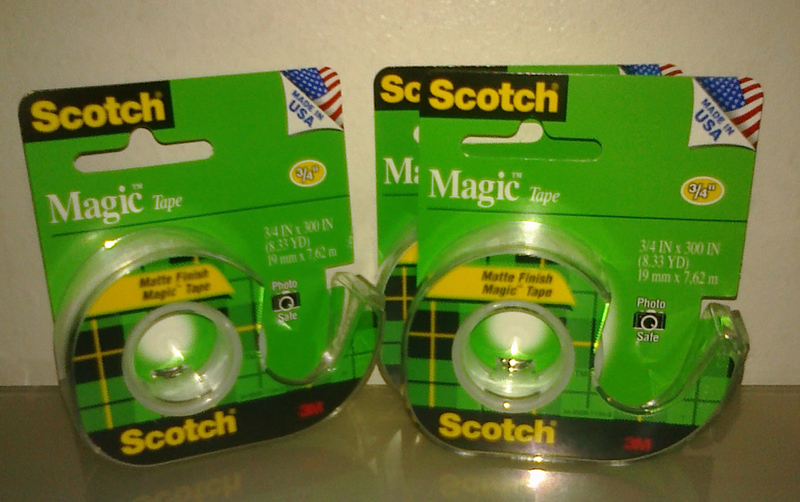 I got 3 rolls of tape for .99¢ - well- tax made it $1.06. That was the only thing I bought- I only went because I was planning a trip to CVS - and they were right across the street from each other! ;-) I did walk the store to see layouts and product branding to try to remember WHO SELLS WHAT!? ON TO CVS- I got FREE EASTER GRASS and a FREE Egg Decorating kit - WOO HOO- I LOVE FREE! I also got 2 free bag tags- They encourage you to bring a green bag - ANY recycled bag to shop with- so they don't waste plastic bags on you. Each bag tag that is scanned for your trip makes .25¢ credit- and every 4 trips you get that $1 back in ECB bucks- just for using a "bring it yourself" bag.. NOT BAD. They had a buy one get one deal- I got an ECB credit for each one that I bough (2) so they were FREE! I also bought a "stock pile" if you will shampoo and conditioner for .77¢ each! Bryndall loves the flowery smells on new shampoo flavors! I WOULD have bought my first tubes of FREE toothpaste- I was ready to buy 4 (free) - since I had the stacking coupons- but the size that would have been free (4ozs) was all sold out (early bird gets the worm.) I decided not to buy tubes for $1 each for food pantry- I have like 6 tubes of toothpaste already in my bathroom. So - I USED THE TAPE I JUST BOUGHT FOR .99¢ at WALGREENS (stop laughing) and I taped the extra coupons I had on the boxes to bless someone else! SOMEONE will appreciate it! ;-) I know it is silly to go shopping really early in the morning- but I wake up at about 5am anyway- HEY People do it on black friday every year right!?? Next time I plan a FREE shop on toothpaste I will aim to go 6AM SUN MORN - when the circular deal is first in effect! It was a good trip- I saved $26 - plus made $14 in ECB to use over the next month at CVS. If I had used the ECBs on that trip I would have literally saved about 50% on that trip! 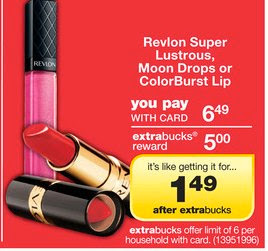 2 SUPER DEALS at CVS today! I have a lot going on this week- we are making our annual trek to the beach- for SANDFEST! 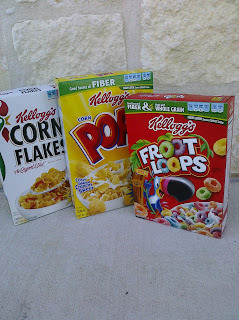 My special deals today were 3 boxes of cereal at on sale price of $1.66 - with a combined coupon for 1.50 off-- making all 3 cost about $1.16 each. NOT BAD! ALMOST got one whole box free! I will take to eat on the beach trip! 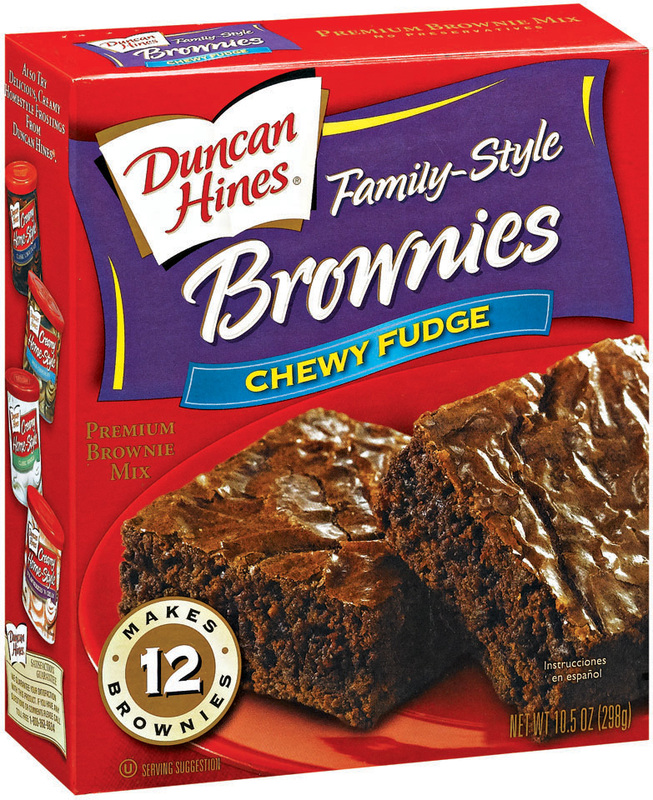 Duncan Hines Brownie mix was marked down to $1 as part of their 10 for $10 promo. I had a .50¢ off coupon from the paper this past Sunday.. viola- just 50 pennies. I will make and take on our trip! 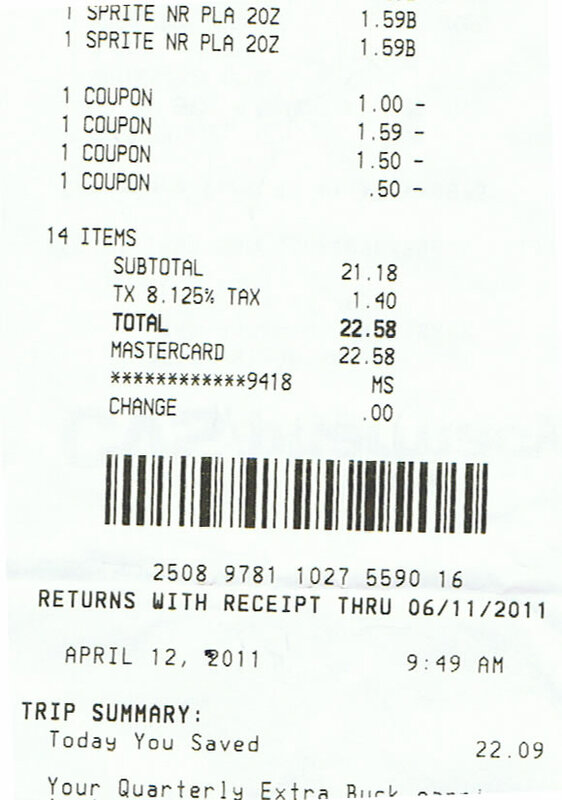 I am attaching the scan of the receipt- since I was especially proud of my savings- about %50! I am learning! I hope you are saving money with coupons too! SUPER S will double coupons EVERY DAY!! OK - I saved most of my .50¢ coupons for the usual items (like canned and frozen veggies and lunch meat) and headed over to Startzville, about 15 minutes away. I was already going there for something else- so I thought I would combine a trip. They also have these little yellow coupons that I saw at the checkout but nobody knew where they came from... they are just "around" - like the HEB "yellow wall" collection.. without the yellow wall?? Confusing!? MY LESSON LEARNED TODAY - REALLY READ THE COUPON!! I know I know - sounds fairly simple and folks assume you read it before filing/ planning trip etc. 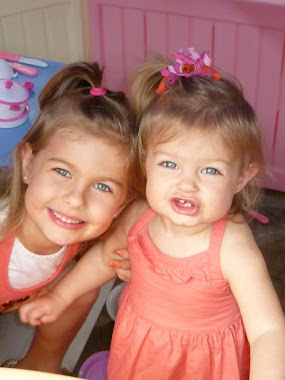 HOWEVER- several of mine said DO NOT DOUBLE and let me tell ya- they DO NOT DOUBLE them! :-) NONE of my printables would scan in and they had to type in one by one.. arrggg... I had 2 people leave my line cause it took so long. OH WELL. I also practiced several of my "leave ems" by leaving a coupon for an item I was not going to buy. The poor girl at the register was just overwhelmed- she was new and not sure of anything!! 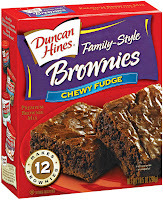 She told me I couldn't use my 2nd coupon for fruit roll ups ($1.50/WYB 2) unless I bought 4 - I told her "I did buy four"- it was just a learning trip all the way around. I DID however SAVE about $8 on my purchases.. not bad!? I found that indeed "eggs" are cheaper in the country - several items I had just purchased recently were ALOT less at Super S- brands like Borden and Folgers and Cheerios. MENTAL NOTE!! 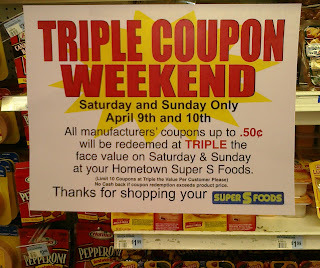 ALSO- I can't come back this weekend - but they are doing a TRIPLE coupon (.50¢ face value) weekend. TRIPLE COUPONS!!! WOO HOO. I can't make it but I am passing it on to the folks in the area. THEY Limit 10 coupons used. HOWEVER - I saw a lady on extreme coupling that had to ring up like 8 transactions to get her special deal. I wonder if they would let me ring up twice... hmm..
SIDE NOTE- They were bought out last week- like literally last FRIDAY- so some plicies may change- I just hope they don't do away with the triples before I have a chance to even shop them!? MY DEAL OF THE DAY was a can of Allen's green beans- it was marked down to .79¢ - I had a coupon from the paper for .35¢ - which I thought would double ( it was a do not double) making the can 9¢ - but instead it became .44¢! Now- it might end up at the food pantry or in a green bean casserole... but hey - .44¢ isn't half bad! I am also collecting 2 sets of newspaper inserts from neighbors etc... so now if the websites on the RIGHT post a special "double up stacking deal" using them... I can now buy 2 instead of 1! All in all I am learning ever single trip I take! Thanks Wendy! We agreed to do it again next month - I will keep my eyes peeled for a B1G1 deal! I am an actress- who loves to sing while building SANDCASTLES! LITERALLY!